When the Overland High School Trailblazers opened their varsity soccer season against the Fairview High School Knights on March 12, the girls were short one player. The referees sidelined Trailblazer Samah Aidah as a result of a pre-game ruling that her hijab, a headscarf worn by Muslim women as a sign of modesty and devotion, created an alleged "danger." 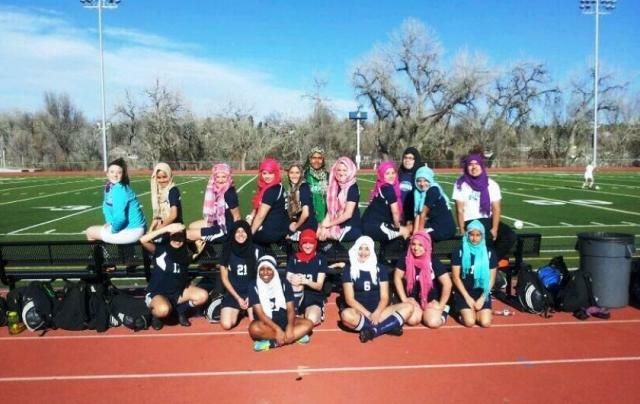 When a referee sidelined Overland High School soccer player Samah Aidah because her hijab allegedly created a "danger," her teammates expressed their solidarity at their next game by all wearing hajibs.